Approximately 2 years ago I finished my Top 20 countdown video goal of listing all years between 1980 and 2009. Since then I've watched the comments come in, some praise, some hate. But recently I have been wondering if some people enjoy a specific year more than another and why. In my experience, the first two motivations are the most common as they relate with people at a more personal and intimate level, especially seeking nostalgia or memories from a certain year. After all, some people might find their top 20 of their birthyear curious enough to warrant a view but might not relate to the songs as they had literally just been born then. 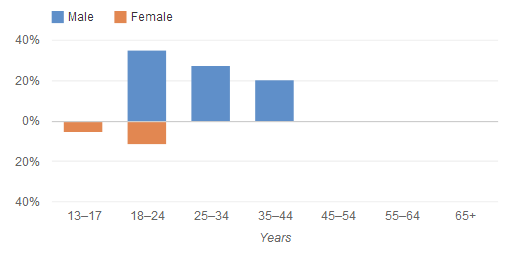 By finding out which ones of my videos have the most views, and referencing them with these motivations, I could theoretically predict my main audience's birthyear and childhood/teenage years. One of the first apparent things is just how much popular the year 2005 is compared to all the others. This would indicate that people relate to it much more than all the other videos. Perhaps this is the year when most of my viewers were kids/teenagers. The four most viewed videos after 2005 are 1991, 1987, 1995 and 1997. This could indicate that those four years are birthyears of my audience, for example. If these premises were true, then that would mean my main audience would be between 17 and 27 years old, which would make them about 8 to 18 years old during 2005. This would make sense as they would be kids/teenagers. It turns out I was quite close in my prediction. It was so accurate that it even surprised me! I guess there's not many conclusions that can be drawn from this (other than I have too much time in my hands to be doing these posts). At heart, it just shows how music is so relevant to people's lives, and how we cannot escape the years and generation we were born into, it is a part of us and it will follow us everywhere. It is part of our identity and there is no point escaping it just because some music we don't like was in the top or because we think mainstream music nowadays might not be as good as before. Eventually we will all become nostalgic with today's mainstream music, just as we are now with the music that played when we were kids.